L.I.F.E. Live Inspired! Feel Empowered! My Beloved for you are not here by accident nor by some mere stroke of luck. It is by Divine Design that you are here with this book in your hand reading the back cover. For you are now ready to embark on a journey to live inspired and feel empowered! You will not walk alone on this journey! There are millions of women, including myself, that stand beside you ready to support, encourage and champion your growth! 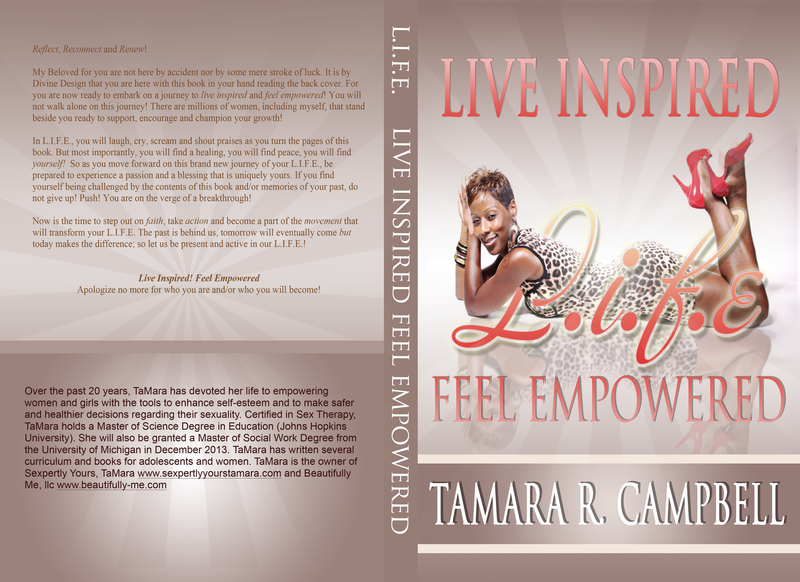 In L.I.F.E., you will laugh, cry, scream and shout praises as you turn the pages of this book. But most importantly, you’ll find a healing, you’ll find peace, you’ll find yourself! So as you turn the move forward on this brand new journey of your L.I.F.E., be prepared to experience a passion and a blessing that is uniquely yours. If you find yourself being challenged by the contents of this book and/or memories of your past, do not give up! Push! You are on the verge of a breakthrough! Now is the time to step out on faith, take action and become a part of the movement that will transform your L.I.F.E. The past is behind us, tomorrow will eventually come but today makes the difference; so let us be present and active in our L.I.F.E.! Apologize no more for who you are and/or who you will become!